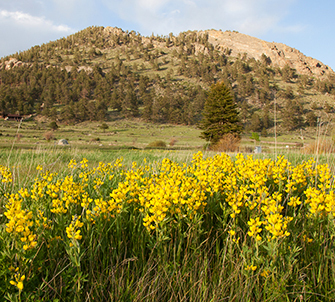 Spring is a special time to visit the Estes Park area. As the days warm up and grow longer, wildflowers begin to blossom in Rocky Mountain National Park. 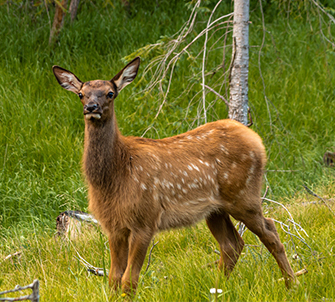 The cows in our world-renowned elk herds show off their spotted and very cute calves. Bring the family, bring the friends to see some of Mother Nature’s best work: Our season of new beginnings. Calving in Rocky Mountain National Park, typically, occurs from mid-May through June. The spots on calves help to camouflage these new-born babies from predators. Our Spring Weekday Special: Save 25% on any Sunday through Thursday stay. Our two-bedroom premium cabins sleep up to six and with this special, rates are as low as $134 per night. Call our helpful and friendly Front Desk Team for a quote on the May stay dates you have in mind. 800-229-4676. Fine print: Stays must conclude by Thursday, May 16th, 2019. Cannot be combined with other offers. For new reservations only. We’re just four minutes to the main entrance of Rocky Mountain National, Park. Our four-season resort includes a fitness center and three outdoor hot tubs. Our modern cabins feature full kitchens, fireplaces, and superfast Wi-Fi. We’re five minutes to downtown Estes Park and even closer to four of Estes Park’s most popular restaurants and taverns. See more on our cabins including a video. For reservations, or to book your stay, call our front desk team at 800-229-4676. Golden Banner in Moraine Park. Golden Banner blooms in May in Rocky Mountain National Park. Guests to our area in the spring will enjoy a variety of outdoor activities At lower elevations, guests can choose from hiking, climbing, horseback riding, fly fishing, wildlife viewing, photography, and just taking in the spectacular mountain scenery. At higher elevations in Rocky, weather permitting, there’s snowshoeing, cross-country skiing, snowboarding, sledding. Rocky is one of the premier National Parks in the U-S. It’s beautiful and engaging every day of the year. In addition to the outdoor activities mentioned above, there are insightful Ranger-led programs every day in Rocky. May is also a fabulous time of the year for birding in Rocky, as our fine feathered friends migrate north from Central and South America. Rocky offers a 90-minute ranger-led Spring Bird Walk Tuesday through Friday at 8:00 am at the Cub Lake Trailhead.